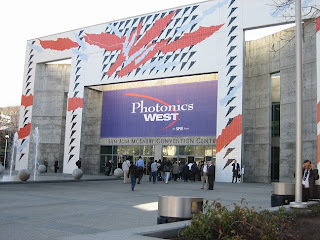 Unfortunately, I didn't manage to get to Photonics West. However both Matthew Ball and Ken Middleton went along representing Lambda and by all account it was a great show. Below are some pictures, kindly taken by Matthew Ball. 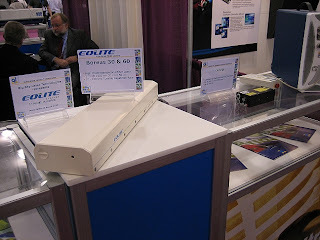 This is a picture of the EOLITE Boreas fibre laser. It was being shown on Quantel & Big Sky's stand as Quantel have an agreement to sell the EOLITE system. To the right of the Boreas you can see an Ultra and power supply for the Brio, both of which are compact Nd:YAG lasers. Some exicting new products were on display on Gentec-EO's stand. 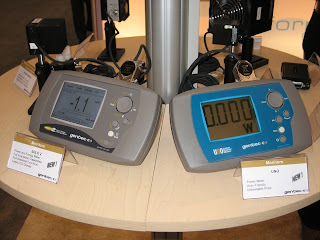 Gentec have recently released two new laser power/energy monitors. The SOLO2 (left) is an updated version of their SOLO laser power & energy monitor and features a far bigger screen than the old SOLO. The UNO (right) is a low-cost laser power monitor, which is economical, simple to use and features the same large screen as the SOLO2.